Flowers come in many different shapes--including bell, trumpet, funnel, star and cross. Tubular-shaped blossoms are usually long, thin blooms with straight sides where the petal edges are fused together. The mouth of the flower is slightly flared. These blossoms are commonly pollinated by long-billed birds, like hummingbirds. Cascade beardtongue (Penstemon serrulatus) is a 1/2- to 2-foot-tall perennial shrub with woody stems. The green leaves are oval-shaped with tapered points and serrated edges. The leaves are usually 1 to 3 inches long. The tubular blossoms clump together on the ends of tall flower stalks. The petals are fused at the sides and flatten at the mouth. These 1/2- to 1-inch-long blossoms range from blue to dark purple. Cascade beardtongue blooms from June through August and thrives in moist areas. Firebush (Hamelia patens) is a large, soft stem shrub 8 to 12 feet tall. This rapidly growing bush grows 5 feet in one summer. It will reach more than 15 feet tall if supported by a trellis. The 4- to 8-inch-long, evergreen leaves are covered with red hairs. Once mature, the leaves develop red or purple speckles. The leaves spread around the stem in groups of three. 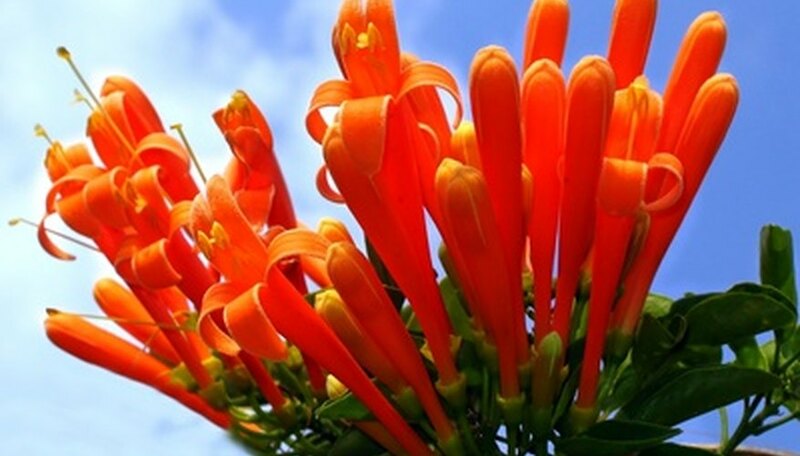 Orange-red flowers form slender tubes, 1 to 1 1/2 inches long. Firebushes produce blossoms throughout most of the year. This shrub is irresistible to hummingbirds and butterflies. Foxglove (Digitalis purpurea) grows 2 to 4 feet tall. This biennial forms rosettes of leaves the first year and then blooms the following year. Blooms appear from June to September with abundant blossoms on a flower spike. The blossoms are deep purple, lilac and white with spots lining each individual flower throat. Use this plant in shady areas, wildflower gardens and waste places. 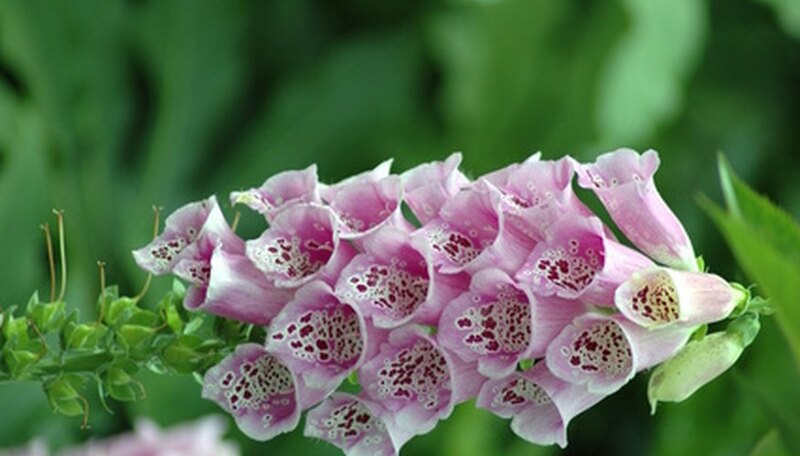 Foxglove is poisonous, so do not eat any part of the plant. Red hot poker (Kniphofia hybrids) produces grass-like clumps of green leaves. The flower stalks shoot up 18 to 80 inches tall and are topped with orange, red, yellow and apricot spikes covered with tubular blossoms. Red hot poker flowers bloom in the early summer. This plant prefers sites that receive full sunlight in the afternoon. Try Prince Igor or Minister Verschuur for yellow flowers. Trumpet honeysuckle (Lonicera sempervirens) is a rapidly growing, evergreen vine reaching 15 to 25 feet long. This twining vine has green, oval leaves. The coral, red and yellow tubular-shaped flowers appear in the spring and continue throughout the fall. Red and black berries follow the flowers. Trumpet honeysuckle attracts birds because of the berries. Fertilizing this plant will cause an increase in leafy growth, but a decrease in flower production.